There is really never a bad time to eat ice cream or sip on some milkshakes, but they are especially worth splurging on when the weather is still hot. Lucky for us Vancouver’s the perfect place to indulge in some fantastic summer treats, from ice cream inspired treats to delicious cocktails, this city’s got them all. Here’s a list of 20 amazing treats you have to try in Vancouver before the summer’s over. 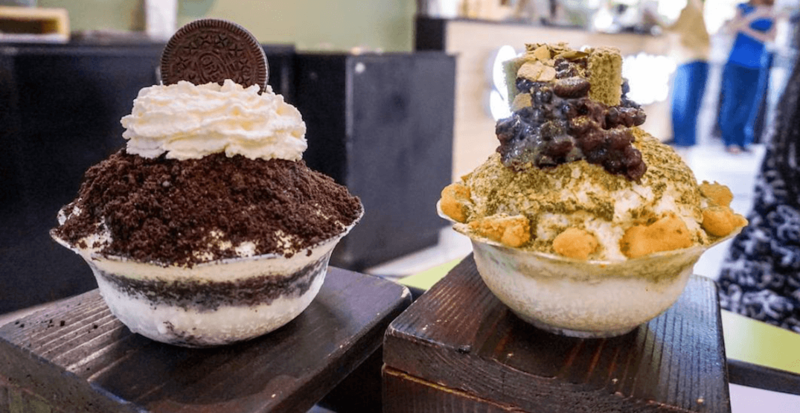 Korean dessert café Milkcow just opened its first Canadian location in Richmond earlier this year, and it has already gained popularity with its famous summer treat, watermelon ice cream sandwich. The sandwich consists of two pieces of fresh watermelon filled with the café’s famous dairy-free watermelon soft serve, and it will make you feel refreshed in an instant. Bingsoo, also known as Korean shaved ice, is a popular summer treat that is made with shaved ice, condensed milk, syrup, and sweet toppings. While Vancouver never lacks great bingsoo places, Snowy Village does it the best. It offers 12 kinds of bingsoo with a generous amount of toppings and you can also get your bingsoo on the go in an insulated bag. We all know what rolled ice cream is, but what about rolled yogurt? It is a healthier choice of rolled ice cream, while still keeping the texture and flavour of the traditional Thai dessert. On Yogurt’s got more than 40 toppings and four syrups for you to choose from, and its yogurt selection is entirely organic and gluten-free. If you love all things matcha, you have to visit Nana’s Green Tea. It offers an extensive selection of matcha-centric items, but our favourite is its signature matcha shiratama parfait. It is made with matcha ice cream, rice-flour dumplings, cereal cornflakes, and matcha pudding, and it is perfect for those hot summer days. PapaRoti’s ice cream bun is basically delicious ice cream sandwiched in between its signature coffee caramel bun. With many flavours available, it is a great summer treat that will cool you down right away. If you’re feeling adventurous, you should try one of its unique flavours like black sesame. Vitasoy is basically everyone’s childhood in a box, and us Vancouverites are in luck — 720 Sweets have created two limited edition Vitasoy ice cream flavours, which will give you the ultimate childhood nostalgia. But hurry, these two flavours will only be available until August 5. The popular Richmond night market stand iTofu has finally opened a store, and that means we’re going to eat an overwhelming amount of tofu desserts all day every day. The shop’s original tofu pudding is great on its own, but you can always customize it by choosing from a long list of toppings like pearls, taro balls, or red bean paste. We all love some cold rose lemonade on hot summer days, and Yum has taken it onto a whole new level by combining it with ice cream. The shop’s popular summer treat, the high tea float, is a delicious cup filled with rose lemonade, earl grey ice cream, whipped cream, and raspberry coulis. You’ll want to sip on it all day long this summer. Who doesn’t love some Margaritas that are bigger than a person’s head? La Casita in Gastown offers some of the most delicious Super Margaritas in town, and they come in tropical flavours like mango and berry. While it is meant for three people, it is totally acceptable to drink it all by yourself. Taiwanese mega-chain Meet Fresh has won our hearts with its refreshing desserts and drinks. When you’re making a quick stop here on a scorching day, always go for its Meet Fresh Signature. It is a bowl filled with herbal jelly, taro balls, and yam balls, and you can also add pearls or red bean paste to make it the ultimate summer treat. Nothing can beat a cup of ice cold fruit tea on a hot summer day. Yi Fang’s signature fruit tea has a green tea base and is packed with oranges, apple slices, passionfruit seeds, and other fruits. Get 50% sugar and 50% ice, and it will be the perfect little cup to cool you down. If you are looking for an easier way to take your burning hot espresso shot in the summer, La Foret’s affogato will be your lifesaver. The Italian dessert is made with scoops of ice cream drowned in a shot of hot espresso, and La Foret offers popular ice cream flavours like matcha, strawberry, and cookies & cream. A Hugo is a popular European cocktail that is typically consumed in the summertime, and Bauhaus is our go-to place to get this delicious drink. It is made with sparkling white wine, fresh mint, elderflower syrup, and a few slices of lime. This refreshingly minty and bubbly drink will make those hot summer days better. A mille crepe cake is made with many layers of thin crepes stuffed with cold pastry cream, and Sugar Lab is our favourite spot to grab some slices on the go. The shop’s most popular flavour is green tea with red bean, but all the flavours there will put you in literal dessert heaven. The Kyoto Gion Dessert Box from Toku is an eight-piece dessert tasting package. It comes with fresh fruits and jelly, house-made dorayaki pancake, Japanese pudding, fruits mocha, tri-colour mochi, clear jelly, red bean matcha soup zendai, and a daily feature. The box is so Insta-worthy and makes the best option if you want to try multiple things on the menu. Buddha-Full is the first organic, raw vegan, and gluten-free café on the North Shore. Its mouth-watering açai bowl includes refreshing toppings like apple, banana, and coconut, and it is the perfect summer treat. When you’re not in the mood for an açai bowl, the Buddha bowl there is pretty phenomenal as well. While Sulmida serves a large selection of icy dessert and drinks, our favourite is the yogurt frappe. It is made with puréed yogurt blended with fruits, then topped with a generous amount of fresh fruits and whipped cream. The shop offers a mango base as well as a strawberry base. The Calpis shot slush from Yuu Japanese Tapas is our favourite summer treat when it comes to slushes. You can choose from mango, strawberry, or melon for its base flavour, and the slush also comes with a syringe of fruit syrup. It is 100% Insta-worthy and super refreshing. Taishoken Ramen is famous for its cold ramen. The ramen bowl comes with a plate of cold noodles, soft boiled egg, and a side bowl of deeply concentrated broth. You should only dip the ramen into the bowl of hot soup for a brief moment so that the soup flavour doesn’t overwhelm the noodles. It is great for those hot day ramen cravings. Panna cotta is a cold Italian custard served with fruit sauce or caramel syrup, and it is a true summer treat. At Ask For Luigi, its panna cotta comes in a vanilla-bean flavour, and it is presented with slices of almond biscotti as well as prunes poached in a red wine sauce. It is a must-have summer treat in Vancouver.